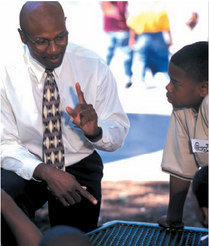 Does your child need a Mentor? • 33% less likely to hit someone. Mission: The mission of We Care about the Children Mentoring Program is to improve youth’s perspective toward education, academic performance and, develop social skills, confidence, rebuild self-esteem and, increase a sense of worth. In doing so we aim to reduce the drop-out-rate, instill hope, build character and encourage participation in service and community activities that will allow them to experience the blessing that comes from serving others. Our youth need our attention. The latest U.S. census figures show that about 35.2 million young people ages 10 to 18 live in the United States today. Of that number, approximately half-or 17.6 million-are at risk of not living up to their potential and could benefit from a relationship with a caring adult mentor. Many of these young people face especially difficult circumstances; one out of four lives with only one parent; one out of 10 is born to teen parents; one out of five lives in poverty; one out of 10 will end up in the juvenile court system; and one out of 10 will not finish high school. Mentoring works, we know this intuitively. We know this through research. In her book, Stand by Me; The Risks and Rewards of Mentoring Today’s Youth, Dr. Jean Rhodes of the University of Massachusetts concludes that mentors influence young people in three important ways, by (1) enhancing social skills and emotional well0being, (2) improving cognitive skills through dialogue and listening, and (3) serving as a role model and advocate. How does mentoring help? In addition to making children more confident in their schoolwork and more trusting of their parents or guardians, mentoring helps youth have better grades, better relationships with adults and peers, lover juvenile arrests, higher self-esteem and, higher school attendance leading to high graduation rates. • Mentoring helps both the mentee and the mentor recognize their abilities and limitations, thus highlighting areas for future development. • It helps prompt thought about career development and come to a realistic conclusion about their career potential. • It can help increase the motivation of the mentee to become a positive contributing adult in the community and society. • The mentee gains a new direction and perspective being successful in life. • It will develop communication skills as well as the obvious listening/questioning skills. • Students build better and positive relationships with parents, teachers, family and peers. • Academic success which leads to more high school graduates and less juvenile delinquents. About the Program: We Care about the Children Mentoring Program mentors at-risk and behaviorial disorder youths in the Atlanta Metropolitan Area, Cobb and Douglas County. We mentor Kids in Distressed, Juveniles, Foster Children and Elementary/Middle/High School students ages 7-18. We encourage, equip, empower and enterprise them to reach their full potential in life academically and socially. We Care about the Children Mentoring Program’s goal is to foster a commitment to young people that will promote friendships, strong interpersonal skills and, reassert a sense of hope in their future. Only through personal mentor relationships can a sense of individual responsibility be reestablished that will give youth the commitment to follow through on a path to adulthood and with a sense of pride and accomplishment.